You are currently browsing the Carpe DMM blog archives for November, 2010. I’ve been waiting for “The City on the Edge of Forever”. If there’s one episode that even non-Star Trek fans should watch, this is the one. It’s often held up as the best episode of the series, and it’s hard to argue otherwise. It won a Hugo award for Best Dramatic Presentation (an honour shared with “The Menagerie“) and a Writers Guild of America Award for Best Written Dramatic Episode, making it the most honoured episode of all time. I know the story back to front, but watching it again you can’t help being reminded why this is such a good episode. It starts with the Enterprise in orbit about a planet, from which is emanating mysterious “ripples in time”. Seeing this right after “The Alternative Factor“, you may feel this bodes ill, given how rambling and plot-holey that episode was after a similar start. A shudder rocks the ship and Sulu collapses after a giant spark leaps from the helm. One wonders why they don’t install simple circuit-breakers to prevent such things. McCoy races to the bridge and gives Sulu an injection of cordrazine to stabilise him. McCoy is putting the hypo away when the ship shudders again, and he falls on the hypo, accidentally injecting the whole contents into himself. He suddenly yells in a drug-induced craze, “Murderers!” and races violently from the bridge. Kirk asks what the effects of an overdose of cordrazine are and learns they include crazed paranoia. We see McCoy enter the transporter room, where the transporter chief for some reason doesn’t turn to see who has walked in the door, and McCoy knocks him out then beams himself down to the planet. Kirk mobilises a landing party to capture McCoy, including Scotty and Uhura for some imponderable reason. They find him amidst some weird alien ruins and Spock gives him a nerve pinch to subdue him. Spock notes that the time ripples are coming from a strange arch, which suddenly speaks to them, stating it is the Guardian of Forever, and that, “Since before your sun burned hot in space and before your race was born, I have awaited a question.” It begins showing them images of Earth’s history, which appear within the arch shape. These images prove that the Earth was black and white in the past. Spock starts recording the images on his tricorder. McCoy regains consciousness and bolts, leaping through the arch… and into the past. Uhura says she’s lost contact with the Enterprise, and the Guardian explains that McCoy has changed history – the Enterprise no longer exists! Kirk and Spock come up with a plan – they will leap into the past, arriving a week or so before McCoy (they can’t pinpoint where he went more precisely) and prevent whatever he does to change history. They arrive in New York in 1930, during the Great Depression. They steal clothes and run from a cop, hiding in a basement where they are found by social worker Edith Keeler. She offers them a job and finds them a place to sleep. Kirk is smitten with Keeler’s far-sighted visionary outlook and a romance develops over the next few days as Spock builds an electronic interface for his tricorder so they can see some of its recorded images and get an idea of what change in history McCoy might cause. The electronic equipment includes radio tubes and, for some reason, a Jacob’s ladder. One can’t help wondering why a device as futuristic and sophisticated as a tricorder doesn’t have a built-in screen… it seems less capable than an iPhone. Spock eventually perfects his tricorder interface, and discovers that Edith Keeler is the pivot point in history. She either dies soon, in 1930, or goes on to become nationally important and meet with President Roosevelt in an advisory role. Kirk guesses that, in his crazed state, perhaps McCoy kills her. Spock speculates that perhaps he saves her, and that she is meant to die. 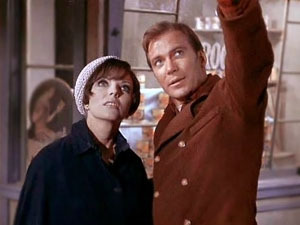 In one of the many memorable scenes, Kirk accompanies Edith for a walk at night. She senses he is troubled and asks to “let me help.” Kirk says those words will be written in a hundred years time by a poet from a planet orbiting the leftmost star in Orion’s belt, and points up into the sky (see image above). This is a beautiful scene, spoiled only by the next shot – a stock shot of New York city at night… with an overcast sky. There’s so much more to this episode that I can’t convey. It’s still immensely powerful. Cannot be recommended enough. Tropes: Cool Gate, Time Abyss, Portal To The Past, Butterfly Of Doom, Set Right What Once Went Wrong, Costumer, Changed My Jumper, Good Samaritan, Mad Scientist Laboratory, Technology Marches On, Zeerust, Not Quite The Right Thing, Retroactive Precognition, Fish Out Of Temporal Water, I Just Shot Marvin In The Face, Born In The Wrong Century, Godwin’s Law Of Time Travel, Save This Person Save The World (inverted), Geeky Turn On, Temporary Love Interest, Gadgeteer Genius, Bamboo Technology, I’m A Doctor, Not A Placeholder, Look Both Ways, Bittersweet Ending. Body count: One bum (accidentally self disintegrated), Edith Keeler. “The Alternative Factor” is one I didn’t remember from the episode title, which is never a good sign with these episodes, though it all came back to me a few minutes in. The Enterprise is orbiting a planet, which Spock describes as pretty normal, with an “oxygen-hydrogen atmosphere”, failing to point out that an atmosphere made of oxygen and hydrogen would be extremely unstable. The ship is then rocked by a bizarre special effect, consisting of a semi-transparent overlay of some random nebula – which, being an astronomy geek, I recognised on sight as the Trifid Nebula – accompanied by camera shaking and dramatic music. Spock is unable to explain the phenomenon, saying only that it was like reality winking out. Sensors pick up a human on the planet where there was none before and Spock conjectures this person could be the cause of the effect. Instead of fleeing for their lives like any sane people faced with a potentially universe-altering power, Kirk and Spock beam down to investigate. They find a strange man who raves about being hunted by a monster, before he falls off a cliff. They take him back to the Enterprise, where McCoy treats him. Kirk is informed that the space rupture has drained the ship’s dilithium crystals, and the orbit will decay in 10 hours – again for some reason they must be using an orbit so insanely low that it will actually decay that quickly. Kirk gets a call from Starfleet, in which he’s told that the fleet is evacuating everyone within 100 parsecs of the Enterprise, and Kirk is alone in fixing this problem that has affected “the entire Galaxy and beyond”. One wonders how they measured that. 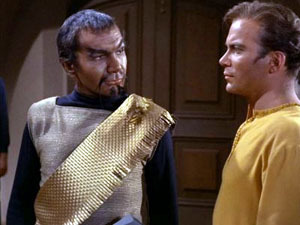 Kirk visits the mysterious man, whose name is revealed to be Lazarus only well after he should have introduced himself, and only because Kirk refers to him by name. I suspect they must have cut the scene in which Lazarus first tells them his name. The mysterious effect rocks the ship again, and we see Lazarus apparently fighting another man in a blue veil of silhouetted special effects. Despite this, Kirk allows Lazarus to wander the Enterprise without a guard! Kirk and Spock do interview him, but without using the lie detector we saw back in “Mudd’s Women” – I guess they forgot they had one. Lazarus runs amok, beaming himself down to the planet thanks to the lack of any sort of guard placed on him. Kirk goes to capture him again and does so after Lazarus falls off a cliff – again. McCoy says, “He’s not going anywhere, not this time.,” and immediately leaves Lazarus alone, unguarded in sick bay. 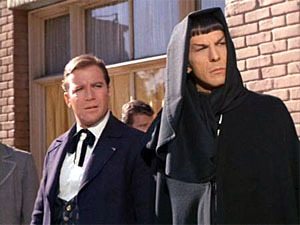 He immediately escapes, while Kirk and Spock have a discussion and speculate wildly and with no real evidence that Lazarus is one of two copies of the same man, one from a parallel antimatter universe, and that they’ve been switching places every time the reality ripple occurs, and if they ever meet each other it will destroy the universe. Lazarus steals dilithium crystals and beams down to the planet again to work on his time machine. Kirk races after him alone, not bothering to take 15 seconds to get a security team together to accompany him. He finds Lazarus, who wrestles him into the time machine. Kirk finds himself in the blue silhouette pace, and emerges to find another Lazarus – a sane and reasonable one who explains everything to him, stating that Kirk is now in the antimatter universe. Lazarus says the universes are connected by a “negative magnetic corridor“, and that Kirk must go back and push the insane Lazarus into the corridor, so the sane Lazarus can wrestle him while Kirk destroys the time machine to trap them there forever and save the universe. Kirk reflects on the terrible fate this is, then goes and does it, with the help of Spock, who seems to understand exactly what Kirk is planning to do with no word of explanation whatsoever. The ending seems very choppy, like they cut bits out to make it fit into the episode time – reinforcing the idea that they may also have cut the first mention of Lazarus’s name. This is a somewhat unsatisfactory episode, probably from poor construction more than a poor idea. The concept is actually interesting, but it hasn’t been carried off very well, with too much poor special effects and plot-induced stupidity on the part of Kirk. Tropes: Mad Lib Thriller Title, Hollywood Science, Screen Shake, Kirk’s Rock, Space Friction, Cardboard Prison, Alternate Universe, Antimatter, Never The Selves Shall Meet, Negative Space Wedgie, Pocket Dimension, Hell Is War, Oubliette, Sealed Evil In A Duel, And I Must Scream, Plot Induced Stupidity. Body count: None, but both Lazaruses doomed to fight each other in limbo for eternity. “Errand of Mercy” gives us the long-awaited introduction of the Klingons to Star Trek. As such, it’s a landmark episode right away. It also shows us just how much the Klingons have evolved over the course of Star Trek’s long history, and not just the obvious forehead ridges either. These Klingons are clearly 1960s references to the Yellow Peril, complete with Asian-oid make-up and Fu Manchu moustaches, with some shades of Nazi-style militarism thrown in. Whereas Klingons later develop into a proud warrior race with a strong sense of internally consistent honour, these Klingons are conniving, deceitful, and downright despicable in their actions, although the leader Kor displays an evilly affable nature by making amusing comments and offering Kirk a drink and so on. And, these Klingons harbour cowards, as seen when one spills his guts to avoid Kirk strangling him in a late scene. No Next Generation-era Klingon would be caught dead capitulating under mere threat of death. The episode opens with the Enterprise approaching the planet Organia – a strategically important habitable planet between the Federation and Klingon spheres of influence, and inhabited by technologically primitive natives. The Enterprise is attacked, completely by surprise, as in the first thing they know about it is when the ship suffers explosions and everyone on the crew lurches to one side. Doesn’t the ship have some sort of… sensors to detect approaching ships? They fend off the attack, destroying the attacking ship. This prompts them to talk to the Organians and to offer them protection against the Klingons. Kirk and Spock beam down, leaving Sulu in charge. Once again this demonstrates the vital importance of placing both your commander and first officer in a position of potential danger together. The Organians have a stagnant medieval level society, with no violence whatsoever. In fact, they’re so non-violent, they refuse any help from Kirk and state that the Klingons are not a threat to them, which confuses Kirk and Spock. The Klingons arrive, drive off the Enterprise, and duly overrun the planet, turning the Organians into slaves and forcing Kirk and Spock to disguise themselves. The leader Kor picks Kirk as his native liaison, issuing various totalitarian proclamations (clearly written in English) through him. Spock is obviously a Vulcan, so Kor subjects him to a mind probe device, but Spock’s superior mental fortitude allows him to deceive it. Kirk and Spock decide to lead a rebellion, even if the Organians are unwilling, and sneak out into a blue-filtered night to blow up a munition dump. This prompts Kor to toss them in a dungeon. Spock is still stumped by the Organians lack of regard for the situation and insistence that nobody will be hurt – you’d think that by now someone as smart as him would guess that they have a secret that means they are capable of defending themselves (and anyone else) from harm. The Organians show up to free them from the dungeon in an unexplained manner. irk and Spock decide to go on the offensive against the Klingons again, despite Spock calculating odds of 7824.7 to 1 against their success, lamenting that it’s “difficult to be precise“. Kirk decides to risk it anyway. The Organians finally step in to prevent Kirk and Kor killing each other, and reveal they are energy beings capable of disarming everyone on the planet and in the massed warships in orbit. They enforce a peace treaty, and state: “It is true that in the future, you and the Klingons will become fast friends. You will work together.” Chalk up another set of virtually omnipotent aliens encountered by the Enterprise crew. This is a decent episode, slightly tarnished by the “evil oriental” portrayal of the Klingons. And of course omnipotent aliens have become cliché in Star Trek, but at this point of the series it was still capable of being a surprise, and the situation provides enough suspense, drama, and novelty to carry the episode. Tropes: Yellow Peril, Evilly Affable, Medieval Stasis, Perfect Pacifist People, Easily Conquered World, Mind Probe, Training The Peaceful Villagers, Hollywood Darkness, Ludicrous Precision, Never Tell Me The Odds, All Powerful Bystander, Energy Beings, Sufficiently Advanced Alien, Foreshadowing. “The Devil in the Dark” is another top notch episode. It begins with a beautiful matte painting of an underground mining operation, set in a very large cavern. From the mining crew we learn that a strange “monster” has been attacking miners, and has killed 50 men already. Another (the hapless Schmitter) dies on-screen to amplify the situation, and we learn the miners are awaiting the Enterprise and its crew to deal with the crisis. Kirk, Spock, and McCoy arrive for a briefing. Spock is interested in a melon-sized silicon nodule that mining chief Vanderberg says are scattered all over the place down in the mines. This is a clear Chekhov’s gun, though you’d be hard pressed to figure that out at this point if you hadn’t seen the episode before. They scan for life, looking for the monster, but find nothing but the miners. Spock raises the spectre of the monster being “not life as we know it”. They leave the briefing room, and curiously Vanderberg opens the door using a button under the edge of his desk. I noticed this because he has to walk back around to his side of the desk specifically to reach the button. Why the door-opening button isn’t, say, on the wall right next to the door is a mystery. They go the reactor room, where the monster has stolen a vital cooling pump from the main reactor. Missing this part will cause the mine to become unlivable in a short time, and – for some bizarre reason – they’re using an outdated reactor for which they have no spare parts at all. For such a vital piece of equipment, you’d normally want some sort of backup system, but apparently not these guys. Scotty beams down to do his best with the reactor, and it’s beyond even his awesome skills. He jury rigs a device made of tubes filled with coloured water, but says it won’t hold long – they need the pump back or they’ll have to evacuate everyone within hours. Kirk calls in a security detail made of 6 redshirts to hunt down the monster, which Spock is now sure is a form of life based on silicon rather than carbon. McCoy dismisses the idea as patently ridiculous, probably more to disagree with Spock than based on anything 23rd century science knows about alien life. The creature kills a redshirt, and Spock and Kirk wound it with phaser fire, slicing a chunk off. They blithely pick up the chunk of the monster, not bothered by the fact that everyone else who has come into contact with the creature before has been instantly incinerated and dissolved by potent acid, leaving only a smoking pair of boots behind. Fortunately, neither is affected in this way. Kirk and Spock decided to chase the creature by themselves – as opposed to gather all their security guys to form a better armed party. Kirk tries to tell Spock to stay behind, as they shouldn’t risk both the captain and first officer of the Enterprise, but Spock counters by calculating the odds that they will both die as exactly 2228.7 to 1 against. What’s more, they reach a forking tunnel, and decide to separate. They make their way through the unlit tunnels to a chamber where there are lots of the silicon nodules. Kirk finds some cracked open and realises what Spock has deduced – they are eggs! The monster is merely a mother protecting her children. 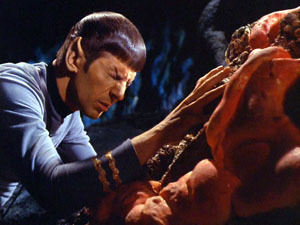 Spock uses the “Vulcan” telepathy technique – looks like we’ve finally lost “Vulcanian” for good – to communicate, learning the creature is called a Horta. 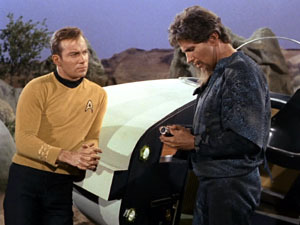 Kirk calls McCoy in to treat the beat, McCoy complains it’s made of silicon – “I’m a doctor, not a bricklayer!” Kirk tells him to treat it anyway. But it’s not quite over, because the miners still want blood, and somehow manage to overpower the well-trained Enterprise security crew and rush the chamber with Kirk and co. in it. The miners, by the way, all wear various orange, yellow, and pink shades of jumpsuits – possibly to give the mine a feminine touch, since obviously there are no women down there. In fact, the only woman we see in the entire episode is a nameless yeoman in the background on the bridge in the closing scene as the Enterprise warps out of orbit. The miners have made peace with the Horta and the babies, allowing them to tunnel while they pick up the scraps and become filthy rich off the minerals they can now extract easily. But all kidding aside, this is an exceptional episode, with suspense, drama, engaging scientific possibilities, mystery, suspense, thrills, a moral message, and a strong resolution. It’s one of the more memorable episodes in the canon, and for good reason. Tropes: Dug Too Deep, Chekhov’s Gun, Technicolour Science, Redshirt Army, Lowered Monster Difficulty, If My Calculations Are Correct, Ludicrous Precision, Let’s Split Up Gang, Rocks Fall, Party Splits, Hollywood Darkness, Monster Is A Mommy, It Can Think, Starfish Aliens, Last Of His Kind, I’m A Doctor, Not A Placeholder, Shaming The Mob. Body count: 50 miners already killed before the opening scene, the miner Schmitter (pre-credits sequence), another miner (not named), 1 redshirt security team member. “This Side of Paradise” begins with the Enterprise approaching Omicron Ceti III, where a colony of humans landed 4 years earlier. Unfortunately, it was later discovered that the planet was bombarded with Berthold rays, which kill animal life with about a week of exposure. So the mission is to be a mop-up operation, clearing away the dead colonists. Kirk, Spock, McCoy, Sulu, and two others beam down. The landing party contains no members in red shirts(!) and, sure enough, none of them end up being killed. They find a healthy and active colony of humans, where they expected bodies. Sulu gets a great line: “Do you think they could be dead?” I like this line, because it shows that nothing is so far beyond the realms of possibility that a Starfleet officer can’t suggest it. The colony looks like a simple Earth farm (no doubt because it was filmed on one), with no modern technology in sight. We meet the beautiful Leila, who serves as girl of the week for… Spock! This is achieved through the expedient of mysterious plants on the planet, which spray people in the face with spores. These spores (a) keep the people alive despite the Berthold rays, and (b) turn them into happy pacifists. Everyone is affected, except Kirk for some reason not explained until later in the episode. 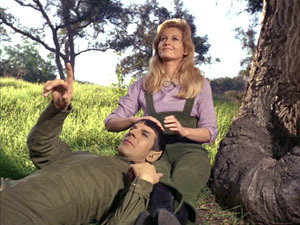 Spock changes off-screen into some farmer overalls and spends much of the episode in pastoral romance scenes with Leila. One wonders where he got changed, since they were outside at the time he got spored, and are never shown returning to the farm. McCoy lapses into a southern accent and goes off in search of a mint julep. The entire Enterprise crew is infected too when someone beams some of the plants up. They abandon ship and all beam down to join the farm colony. The colony leader, Elias Sandoval, tells Kirk to relax and enjoy the good life. Kirk gives a Picard speech, stating that humans weren’t meant to live easy lives, they need challenges. He storms off to beam back to the Enterprise and consider the situation. But how does he beam up if nobody’s up there to activate the transporter?? This is a jarring lapse of continuity within the series, in which it’s pretty well established that the transporter requires an operator on board ship. Kirk then laments in a log entry that unless he can figure out a way to bring everyone to their senses, he is doomed, since he can’t pilot the ship alone. This seems odd, since the captain should presumably be trained in helm and navigation, and the engines should in any reasonable ship manage to stay in one piece long enough for one trip. Perhaps the engines are so unreliable that Scotty really does need to nurse them along constantly, so they don’t explode or something. Kirk is sprayed by a flower and succumbs briefly to its effects, but manages to throw it off by getting upset about leaving the Enterprise. He realises that strong emotions break the thrall of the spores, and tricks Spock into beaming up, then insults and initiates a fistfight with him. Spock recovers just before bashing Kirk’s brains out with a chair, and the two of them engineer a sonic anger generator. Leila calls and requests to beam up, saying she has “never seen a starship”, which is weird, since she arrived on this planet just four years earlier, presumably on a ship. Spock breaks her heart with his cold logic, which snaps her out of the spore-induced rapture. She agrees they need to evacuate all the colonists. The anger ray brings everyone on the planet to their senses, and an orderly evacuation is begun. In the denouement, Leila says that Spock never told her his full name. He says, “You couldn’t pronounce it.” This was a surprise – I’d always assumed Spock had no other name. This episode also has the first use in the series so far of the word “Vulcan” as an adjective to describe Spock, although earlier someone also uses the word “Vulcanian” that everyone has been using so far in other episodes. Maybe this is the transition episode! We shall see as the series continues. Basically this is an episode designed to give Spock a love interest, and to do that they had to devise some form of mind-affecting phlebotinum to release his inhibitions. We’ll see this again later, done in a different way. Basically it’s another way of writing around an established fact of the story universe. Anyway, overall I think this is an okay episode. Not great, but not bad either. Tropes: Negative Space Wedgie, Uncanny Village, Space Amish, Gaussian Girl, Girl Of The Week, Perfect Pacifist People, Everybody Must Get Stoned, That Cloud Looks Like, Measuring The Marigolds, Only Sane Man, Ooh, Me Accent’s Slipping (in character), Patrick Stewart Speech, Insulted Awake, Emotion Bomb, I Am What I Am. “A Taste of Armageddon” is another memorable episode, for its exploration of the social issues involved in warfare. It begins with the Enterprise approaching a star cluster and bent on establishing diplomatic relations with the inhabitants of the Eminiar system, known to have developed space flight, but not yet ventured outside their own solar system. On board the Enterprise is the officious Ambassador Fox, whose droopy eyes remind me of Droopy the dog. The Enterprise sends a hailing message to the populated planet of Eminiar VII, which is replied to with a “Code 7-10” signal. This is a Starfleet code signal meaning to stay away and not to approach under any conditions. One wonder why the Eminians are using a standardised Starfleet code signal if they haven’t made contact with the Federation yet. And of course, as with all inviolable orders in the Star Trek universe, the Enterprise immediately ignores it, this time on the orders of Ambassador Fox, who has the authority to overrule Kirk on this mission. Kirk, Spock, and three redshirts beam down to assess the situation before risking sending Ambassador Fox down. They are met by girl-of-the-week Mea 3 and a group of guards in extremely funky uniforms complete with bizarre hats and hugely flared overall trousers in bold asymmetric colouring. The landing party is treated civilly and introduced to the leader Anan 7 – they like using numbers as parts of names here. Anan 7 explains that the Enterprise is in danger of attack from a civilisation on Vendikar, the third planet in the Eminiar system, with whom Eminiar VII has been at war for over 500 years, and that was why he warned them to stay away. No sooner has he said this than the nearby combat computers register an attack, which destroys part of the city and kills thousands of people. Only Yeoman Tamura‘s tricorder registers no explosions or radiation or anything else. Spock realises that the war is fought entirely as a computer simulation. Anan 7 confirms this and says that the calculated casualties have 24 hours to report to disintegration chambers for termination (apparently they use Earth time on Eminiar VII). Kirk is horrified. He is even more horrified when Anan 7 informs him that the Enterprise was also “destroyed” in the attack, and his entire crew must now report for disintegration. 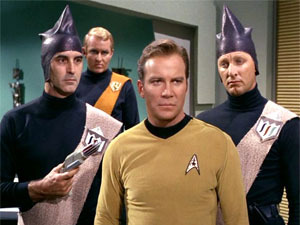 Kirk refuses, but Anan 7 explains that everyone must comply with the computer simulation, or else Vendikar will consider their treaty broken and may attack with real weapons. Anan 7 explains that this is a much cleaner and neater way to fight a war – it is war without all the expense or the messy destruction of property and culture. To ensure the Enterprise crew comply with their ordered disintegrations, Anan 7 imprisons Kirk and the other landing party members (who were not declared as casualties). Chalk one up for Kirk’s suspicions over an ambassador’s overtures of peace. All this happens in a heavily front-loaded barrage of exposition within the first 15 minutes. It’s a shocking scenario, yet if you don’t think about it too closely you may find yourself disturbed by the fact that fighting a war this way does sound cleaner and less wasteful. But something is clearly horribly wrong with the entire situation. It requires people to willingly submit themselves to death at any time, with just a day’s notice. When Kirk expresses incredulity to Mea 3, she explains that it’s their duty – if they don’t report for death, then they will bring terrible and terribly real war and destruction down on their entire planet. This is such a horrible thought that everyone goes along with the set-up. Scotty, on board the Enterprise, enters a log report in which he mentions that “the captain and first officer” are missing on the surface – making no mention whatsoever of the three redshirts with them! Yes, they’re that expendable. In an attempt to make sure everyone on board dies, Eminiar opens fire on the Enterprise, using a “sonic attack”. It must be a particularly advanced sonic attack for the sound waves to travel through the vacuum of space and affect the Enterprise in orbit. The anonymous helmsman extra reports that the attack is an astonishing “decibels measuring 18 to the 12th power” – or about 10 to the 15th power for anyone who prefers working in decimal notation. Anan 7 uses a voice synthesiser to impersonate Kirk and tell Scotty back on the Enterprise that the natives are friendly and everyone on board should beam down immediately for shore leave. This makes Scotty a bit suspicious, but pleases Ambassador Fox. Fox orders Scotty to lower the screens (again, they haven’t yet switched to “shields”), which he’d raised during the attack (explained away as a misunderstanding by Anan 7 using Kirk’s voice). Scotty sensibly refuses point blank, which angers Fox, who goes to beam down. Fox and his nameless assistant are captured as soon as they appear and are dragged off to a disintegration booth. Kirk and Spock have captured some Eminian disruptor weapons and rescue the ambassador, destroying a disintegration booth or two along the way. This causes the Eminians to fall behind in their quotas of disintegrations, making Anan 7 worry that Vendikar will really attack. Kirk gets into a fistfight with two Eminian guards… and loses! Now there’s a first. He’s dragged off to the war room. Anan 7 orders him to tell the Enterprise crew to report for disintegration. Instead, Kirk tells Scotty to implement General Order 24, in two hours, which he then explains to Anan 7 is to destroy the entire planet. Spock and the redshirts arrive and Anan 7 goes mad with worry that the treaty has been broken and now Eminiar and Vendikar will have to fight a real war. Kirk agrees, and destroys the combat computers! He explains that the fear now consuming Anan 7 is the same as the fear that will be occurring on Vendikar – they won’t want to fight a real war any more than Eminiar. The solution, Kirk says, is to contact Vendikar and agree to stop the war. A sensible outcome, with Fox left behind to mediate a peace agreement as the Enterprise leaves orbit. Despite it’s share of niggles, this is a good, solid episode, with a very thought-provoking premise and a dramatic climax. It’s one of the episodes that really pushes the boundaries of what an alien society can be like in a mostly believable way. The only real problem, if you think about it, is that everyone on Eminiar (and presumably Vendikar) has been so indoctrinated with the concept of their ongoing war that they’re willing to die at a moment’s notice. I don’t think any society could be that well trained. Someone, somewhere, must have formed some sort of resistance movement to try to break out of the system. Yet that idea is dismissed completely. As Anan 7 shows, they can certainly feel fear of destruction, so it’s not like they are immune to caring about themselves. But nevertheless, it’s hard not to get dragged deeply into this episode and come out of it feeling like it was worth watching. Body count: 2 random Eminians disintegrated in disintegration booth on-screen, 2 Eminian guards shot by disruptors, Ambassador Fox’s assistant shot by disruptor. Unknown numbers of other Eminians disintegrated off-screen during the episode. Ah… “Space Seed“. A true classic. This is a very welcome sight after “The Return of the Archons“. Everyone reading this probably knows that this episode forms the back story for the film Star Trek II: The Wrath of Khan. Here, we meet Khan for the first time, a survivor adrift in an ancient Earth ship – a ship dating from the mid-1990s! This is so unimaginably old that it is transmitting a signal in Morse code(!!) rather than anything more modern. Uhura recognises the old “CQ” call sign by ear, showing once again how versatile she is – she could probably operate every system on the ship without the manuals. We also learn that the 1990s were a period of world war. Thankfully that part of the prediction didn’t come true. Kirk sounds a red alert and various members of the bridge crew run about aimlessly, their random meanderings now with an increased sense of urgency. There’s a delicious bit of Spock versus McCoy banter, then they head for the transporter room, calling the ship’s historian Lieutenant McGivers in to assist. Why a military vessel has a specialist historian on board is something of a mystery. She’s shown as basically having no role on board except to paint pictures of classical warriors and to be on call in case the captain ever needs assistance with Earth history for some reason. I guess it pays to be prepared. McCoy gives what might be his first rant against the evils of transporters, objecting to being split into component molecules and reassembled elsewhere. He maintains this antipathy to the device throughout his career, to the amusement of everyone else. My reaction is more to wonder why everyone else is so blasé about it. Anyway, they beam over to the drifting SS Botany Bay. The initials “SS” are mentioned, but not explained. One presumes they mean “steam ship”, as such a primitive ship is no doubt powered by steam. On board are people preserved in cryo-capsules of some sort. The first one we see looks suspiciously like a blue-skinned space babe, until we see that it’s just a blue light shining on her face. One guy wakes up, and of course it’s Khan himself, who is taken to the Enterprise sickbay to recuperate from being asleep for over 200 years. He wakes up and holds a knife to McCoy’s throat, which prompts a moment of awesome from McCoy, who wins Khan over with his bravery. Kirk appears and chats for a minute, before showing Khan how to access all of the Enterprise‘s technical details on the sickbay computer. This is the second time Kirk has been friendly to a fault to someone he really should be more wary of. Who put this guy in charge of a military vessel? Right at this point in the episode, a huge crack of thunder occurred right outside my window, punctuating Kirk’s statement ominously. Even the weather gods like this episode. Eventually – and without the help of McGivers, who is busy being seduced by Khan – they identify Khan as Khan Noonien Singh, a genetically engineered warlord from the turbulent time in Earth’s history known as the 1990s. This took some considerable digging through the library computer tapes, as they mention several times earlier that records from this time are sparse and incomplete, and nobody really knows much about the time. Despite this, Scotty confidently declares that Khan was “always my favourite of the 1990s dictators”. Either he has some exceedingly weird and esoteric interests or he’s lying through his teeth. 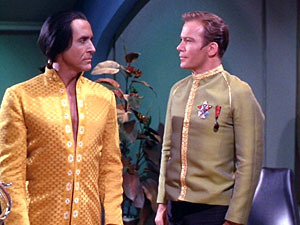 Using his new-found knowledge of the Enterprise, Khan succeeds in taking over the ship and reviving his followers, leading to the inevitable one-on-one fist fight between Kirk and Khan. This should, by all accounts, by a terrible mismatch, because Khan is genetically engineered to be superior in every way, and states that he has the strength of five men. Despite this, he doesn’t even manage to rip Kirk’s shirt – even a rubber-suited Gorn who can barely move managed to do that! Kirk eventually smacks Khan over the head with a bit of tubing that he pulls out of some vital engineering system or other. Of course that seed would burst into a roaring rampage of revenge a mere 15 years later, in a tale told in Star Trek II: The Wrath of Khan. But that’s a story for another post. Hmm, yes.. I should follow up when I’m done with the TV series by doing the movies. A fantastic episode. Total win across the board. Tropes: Everyone Knows Morse, I Want My Jetpack, The Great Politics Mess Up, Human Popsicle, Popsicle Splat, Sealed Evil In A Can, Classic Villain, All Girls Want Bad Boys, Super Soldier, Improvised Weapon, Penal Colony, Rule of Symbolism, Wickedly Cultured, Foreshadowing. Body count: 12 of Khan’s followers dead off-screen in failed hibernation capsules. “The Return of the Archons” is a strange episode. It begins in medias res again – they seem to have liked doing that in Star Trek – with Sulu and Lieutenant O’Neill attempting to evade what looks like a group of roughly 1850s-era Americans. O’Neill runs off while Sulu beams up, but not before being accosted by what look like cowled monks wielding blowguns. Sulu appears back on the Enterprise, and his mind has been snapped, leaving him in a blissful and non-responsive state. Following the credits, Kirk, Spock, McCoy, and various expendables beam down to investigate and recover O’Neill. We learn that this is the planet Beta III, and is apparently inhabited by aliens who resemble 1850s Americans and inhabit what looks like the Universal Studios wild west backlot. Apparently a hundred years ago another Earth ship, the USS Archon, was lost on this planet, and Kirk’s mission is to find out what happened to the crew. Eerie music plays to underline the fact that all the natives seems blissed out in an obviously unnatural way. The landing party is dressed in appropriate costume, so are taken for visitors from another town, and a guy tells them to find a room before the “Red Hour” Festival. We soon learn what this is when the clock strikes six and everyone goes crazy, getting into fights, smashing windows, and sharing passionate embraces. Naturally a woman races up to Kirk and leaps into his arms, kissing him passionately, while Kirk does his best to not fend her off. The story develops into the discovery that this bizarre society is run by a mysterious “Landru” who “absorbs” people into some sort of telepathically induced state of constant happiness, known as “the Body“. The only time they can let their hair down, so to speak, is during the “Red Hour” Festival. Kirk figures out that Landru is actually a computer and destroys it by arguing logic with it, pointing out that the people are suffering because they have no creativity, thus Landru is evil and must destroy itself. Somewhat surprisingly, this argument works. Behind the actual plot, there are several nagging questions left completely unanswered. The first expectation is that perhaps one of the Archon crew was the original Landru, and left behind a computer to take care of the natives when he died. But it turns out that the original Landru was a native some 6000 years ago – so the planet was like this when the Archon arrived 100 years ago. Perhaps we’ll get some other interesting story about what happened to the original Archons and how they coped on this strange world. Nope. Apparently they just arrived and got absorbed and that was the end of it. So much potential wasted there. Then there’s no real explanation of the Festival either. Kirk and Spock surmise that it’s to let off steam that can’t be done when everyone is dosed up on happiness. That sounds sensible at first glance, but then the planet is hardly the Utopia Landru wants, is it? The people go completely bonkers during the Festival – why doesn’t Landru do anything to try to stop it? And with the amount of destruction wrought every night – windows smashed, things burnt down – how do they manage to rebuild it all during the day each time? Kirk and company are helped by a sort of underground resistance against Landru – people who haven’t been absorbed into “the Body”. The big question here is how do such people exist at all? And what do they actually do when there aren’t strange unabsorbed aliens running around to protect? And then there are the cowled enforcer monks, who wander around ordering people to be happy, and killing anyone who doesn’t obey by pointing their hollow tubes at them. As Spock points out, the tubes have “no mechanism”, ad he can’t figure out how they actually have any physical effect at all. You’d think we might get some hint of an explanation for this – but no, it’s never mentioned again. And why the heck doesn’t Kirk contact the Enterprise sooner to appraise them of the situation, and learn from Scotty that the ship is under attack? Why doesn’t Scotty call Kirk to let him know?? Why doesn’t the Enterprise continuously monitor everything the landing party says as routine procedure? And I think this is the first episode where the Prime Directive is mentioned. This Starfleet standing order says that Starfleet personnel are not allowed to interfere with the social development of a world that has not made interstellar contact. It’s the single most important and inviolable rule in Starfleet. Naturally, it’s mentioned and then immediately dismissed by Kirk as not applying in this case, because he regards the current state of affairs on Beta III as stagnant, and not developing. Some other points of note: McCoy is absorbed at one point. I was thinking that Spock should try a mind meld on him – and he actually does so! Unfortunately it doesn’t seem to work, in another example of having to render an introduced plot device non-working in order to avoid it short circuiting the plot of another episode. And Spock and Kirk actually share a literal “Are you thinking what I’m thinking?” moment when they both realise Landru must be a computer. Tropes: Planetville, Uncanny Village, World Of Silence, A Fete Worse Than Death, Utopia Justifies The Means, Of The People, Path of Inspiration, Master Computer, Deus Est Machina, Individuality Is Illegal, Prime Directive, Screw The Rules, I’m Doing What’s Right, Logic Bomb, Heel Realisation, What Happened To The Mouse? Body Count: One insane computer. “Court Martial” is exactly what it says on the tin. Captain Kirk faces a court martial over the death of crewman Ben Finney, ejected in an ion pod during an ion storm. Procedure is to only eject the pod containing a crew member during a red alert, and only with sufficient warning to allow the crew member to leave the pod – which is what Kirk says he did, despite the fact that Finney hated his guts for an incident between them years ago. But the Enterprise‘s computer records say he ejected before declaring a yellow alert. This is all resolved in a court martial hearing. All the action takes place on Starbase 11, which gains the distinction of being one of very few places that the Enterprise visits in more than one episode. We even see a new matte painting of the starbase, showing it in what looks like a red sunset mood. This painting is nice, and better yet, consistent with the daytime matte painting of the same base seen back in “The Menagerie” (which also included a court martial – of Mr Spock). We also again see the Seattle Space Needle-like buildings on flat scenery cutouts through the windows of Commodore Stone‘s office. We meet Jame Finney, Ben’s young teenish daughter, who accuses Kirk of killing her father. She’s wearing a good example of space clothing – a bizarre skirt made of some shiny reflective material. We meet Areel Shaw, a former love interest of Kirk’s, who has the unenviable job of prosecuting the case against him. We also meet attorney Samuel Cogley, who defends Kirk, and is a Luddite, preferring a room full of musty old books to a computer that can contain more legal precedent than an entire library. This also comes out in his summing up speech in the court, when his defence is basically built on the premise that computers are impersonal and not to be trusted. Oddly, this argument doesn’t go over well, because the computer has recorded a damning video of Kirk pressing the eject button before declaring red alert. It doesn’t occur to anyone that the video could possibly have been faked. “Computers don’t lie!” declares the Commodore. Which brings up another oddity. Kirk is shown pressing buttons on his captain’s chair, that are clearly labelled “Yellow Alert” and “Eject Pod”, with the unused “Red Alert” button also there, making a trio of buttons with no room for much else on the chair arm. So the entirety of the captain’s chair’s right armrest is taken up by these three buttons? How often would these buttons be used?? Particularly given every single other time we see an alert sounded in Star Trek, it’s by verbal order? Some amusing oddities: Spock refers to himself as “Vulcanian”, rather than the later standard “Vulcan”. Areel refers to Dr McCoy on the witness stand as an “expert in psychology, especially space psychology“. And mid-episode, Jame Finney suddenly changes her mind and declares that she believes Kirk and hopes that he evades the court martial charge – this is never satisfactorily explained (though turns out to have been because of extra script material that was cut for time, in which Jame reads some of her father’s letters and realises what a bitter man he was). Spock eventually cracks the case by the odd expedient of playing chess with the Enterprise computer, prompting incredulity from McCoy. The important point here is that Spock programmed the computer for chess himself, and the computer can never make a mistake, so obviously Spock can do no better than draw with it, yet he beats it five times in a row. This proves beyond any doubt the computer has been tampered with, and the video log of Kirk is fake! Whodunnit? Why, Finney of course, who faked his own death to frame Kirk and ruin his career. Now they have to track him down, hiding somewhere on the Enterprise. To do this, rather than use scanners or something, they evacuate everyone from the ship but the bridge crew and the court, and use a hypersensitive sound amplifier – capable of “boosting sounds by one to the fourth power“! Except this sound amplifier apparently can’t pick up the sound of anyone talking, and can only amplify heartbeats. McCoy then uses a “white sound” device to cancel out the heartbeats of everyone on the bridge, leaving one heartbeat remaining: Finney! Kirk goes to confront Finney alone, because of course this is something he’s got to do himself. An inevitable fistfight occurs, complete with Kirk’s shirt ripping – the entirety of which could have been avoided by Kirk heading down there with a couple of armed security personnel. Finney makes a mad speech and eventually loses. We get to see Uhura take the helm as the Enterprise‘s orbit decays due to some Finney sabotage, which is rectified just in time. She’s clearly far too talented to be stuck on communications. Overall, not a bad episode. 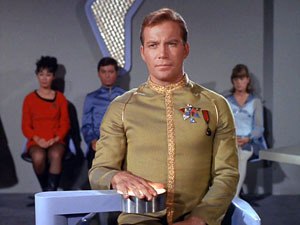 The drama of Kirk’s court martial creates significant tension until you learn the twist near the end. And Spock and McCoy get some amusing banter as their irksome relationship begins to develop throughout this first season. Body count: Ben Finney, killed off-screen before the episode begins… or is he?! This presents some interesting observations. Firstly, notice that the amounts of fat are different for Australia and New Zealand. I’m guessing this is because here in Australia Subway uses leaner ham than in NZ, while conversely we get fattier turkey than in NZ. Secondly, the veggie sub, which has negligible fat content in the filling (essentially just lettuce, tomato, onion, carrot, and cucumber – the “6 grams of fat or less” subs are defined to have “no cheese or condiments”) must be getting all of its fat content from the bread. The fact that this is the same in both countries is mildly reassuring. Thirdly, the combined Australian ham & turkey sub contains a fat content that is, understandably, between the fat content of the ham or the turkey alone – assuming it contains a fraction of the ham plus a fraction of the turkey of the individual subs, not just both lots added together. The NZ ham & turkey is a bit more puzzling, since it contains the same amount of fat as a turkey sub alone! Yet we can see the turkey is fattier than the ham, so if we remove some turkey and add an equal amount of ham, the total fat content should drop. Well, given these data, let’s see what we can deduce. Let’s call the amount of ham in a ham sub a “serve of ham”, and the amount of turkey in a turkey sub a “serve of turkey”. Then in Australia a serve of ham contains 1 gram of fat and a serve of turkey contains 2 grams of fat, while in NZ they contain 1.4 and 1.8 grams of fat respectively. A ham & turkey sub contains exactly twice as much turkey as ham! The total amount of meat in a ham and turkey sub is 1.08 serves! In other words, if a serve of turkey is more than 9/7 the size of a serve of ham, then a ham & turkey sub gives you less meat than a turkey sub. But if a serve if turkey is less than 9/7 the size of a serve of ham, then a ham & turkey sub gives you more meat than either a ham sub or a turkey sub alone. A sensible assumption is that Subway is likely not going to give you less meat on a ham & turkey sub than on a turkey sub, so we can be pretty sure that a turkey sub contains no more than 9/7 the amount of meat of a ham sub. This then allows us to calculate that, in Australia, turkey is at least (2/1)/(9/7) = 1.56 times as fatty as ham, while in New Zealand turkey is at least (1.8/1.4)/(9/7) = 1 times… at least as exactly fatty as ham! What this in turn says about turkey and pig farming practices in Australia and New Zealand is left as an exercise for the reader.